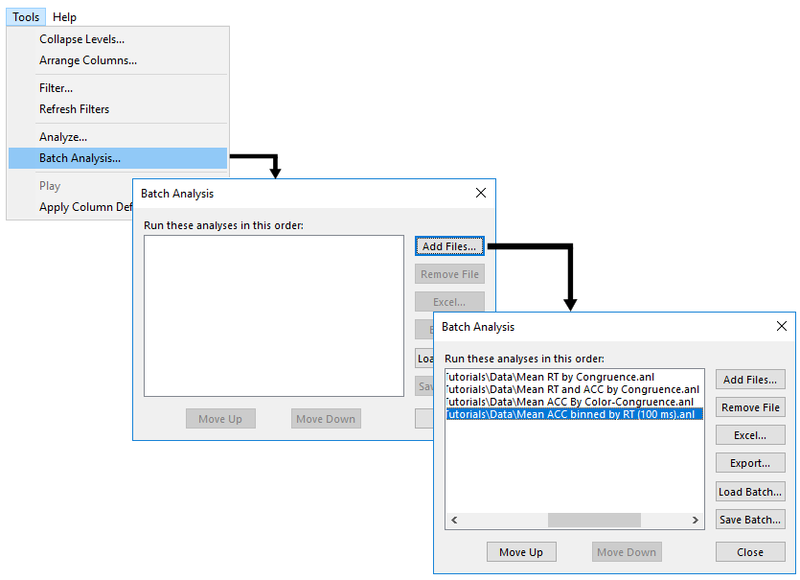 The Batch Analysis command on the Tools menu displays the Batch Analysis dialog. This dialog allows running a batch of pre-created analyses (ANL files) in succession (see E-DATAAID: Creating an Analysis . Analyses are created via the Analyze command on the Tools menu. They are saved as .anl files using the Save Analysis button on the Analyze dialog. When running a batch of analyses, the results may either be plotted/copied to an Excel workbook, or output to a text file. Use the Add Files button to add analysis files to the list via a multi-selection Open dialog. The entire list of analyses will be performed when an action is specified. Use the Remove File button to remove a highlighted file from the list. This button is disabled if no files are highlighted. Use the Move Up and Move Down buttons to reorder a highlighted file in the list. This button is disabled if no files are highlighted. Use the Excel button to load each analysis in the list, run it, and copy or plot the results in an Excel workbook. If the analysis was saved with Plot mode, it is plotted. If the analysis was saved with any other display mode, it is copied. This button is disabled if there are no files in the analysis list. Use the Export button to load each analysis in the list, run it, and dump the results to a tab- delimited file. E-DataAid prompts the user to name the text file to be used for output. Use the Load Batch button to load the names of the analysis files from a batch file created with the Save Batch button. The batch file is a text file with the .bat extension. It contains the names of the analyses to be run. Use the Save Batch button to save the names of the analysis files in the list to a batch file. This batch file can later be read with the Load Batch button. This button is disabled if no files are in the analysis list.